Weeks ago Globe Telecom officially announced their newest addition to the long list of Globe prepaid endorsers and he is none other than the host comedian and star of the upcoming remake of Petrang Kabayo, Vice Ganda. Together with her tagline "May Nag-text", Vice is endorsing Globes latest service the Super All Text 20 service and Unlimited Text 20 service. Vice is very thankful that he is given the chance to be part of this influential telecom company and be able to endorse a new service that will yet again benefit those who are using prepaid sim cards. 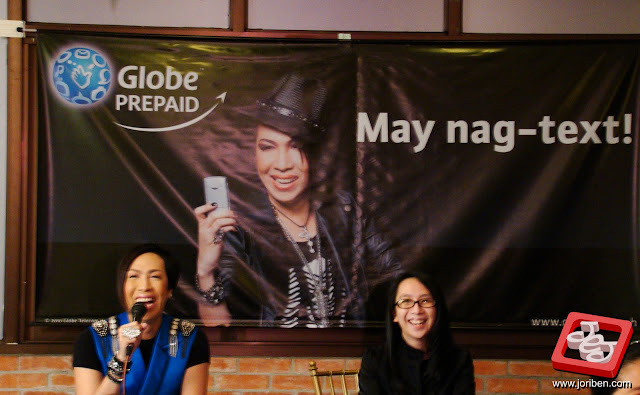 Vice Ganda together with Ms. Kristel DIzon of Globe Telecom answering questions from the media. All Text 20 service gives all Globe Prepaid user enjoy 200 text messages to all network for only P20. On the other hand Unlitxt20 service enables the user to send unlimited text messages to all Globe and Touch Mobile subscriber also only for P20. Super All Text 20 promo will start on August 30 until Sept 30, 2010 while Unlimited Text 20 will continue its service. Here is the newest commercial of Super All Text 20 featuring Vice.